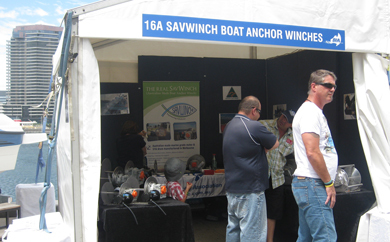 Melbourne decided to shine with great summer weather (for most of it) and much interest in our Savwinch products at the recent Melbourne Summer Boat Show. For three days from Friday 3rd – Sunday 5th February the New Quay Docklands was transformed into boat city with many boating retailers and boating accessories available for display, demonstration and purchase. Nick and Eleni from Savwinch had a marque stand in the middle of the show with their range of electric boat anchor drum winches on display. Thank you to all those that visited our stand and showed interest in our products at the show and especially to those that made purchases. Look out for other times throughout the year where Savwinch will be exhibiting. At the boat shows you can meet us in person, look at our products up close and enquire about the great show specials on offer.